I don’t know if its me getting older (being 33 is hard, kids! ), but lately I’ve had a harder time remembering if I’ve closed the garage door or not when leaving the house. I’ve wanted to have a wifi connected garage door opener, but I didn’t want to replace my perfectly good garage door opener I have now. So one day when my girlfriend told me she didn’t remember if she closed the garage door, I reached my limit and decided that I was going to go online and find some sort of sensor to tell me if the garage was open or not. What I found were some Raspberry Pi or Arduino sensors – not really what I was looking for. I wanted something a bit more professional. I ended up coming across the Chamberlain MyQ Garage Door controller. It was expensive at $129 (a brand new MyQ-Enabled Chamberlain garage door opener is $200), but after spending my lunch hour driving home and back to work, I was ready to pay that. The first thing I had to do was check compatibility – does the garage door have the photosensors to prevent the garage from closing on someone or something, and is it using a compatible frequency and code. I happen to have a compatible Chamberlain LiftMaster, as well as an open 120V outlet near the garage door opener, so I was ready to order and go! Installing it was easy, except for the part where they didn’t tell you what size drill bit to drill the pilot holes for the screw anchors (5/32″). I guess thats something they expect you to know, and this DIY-newbie didn’t know that. 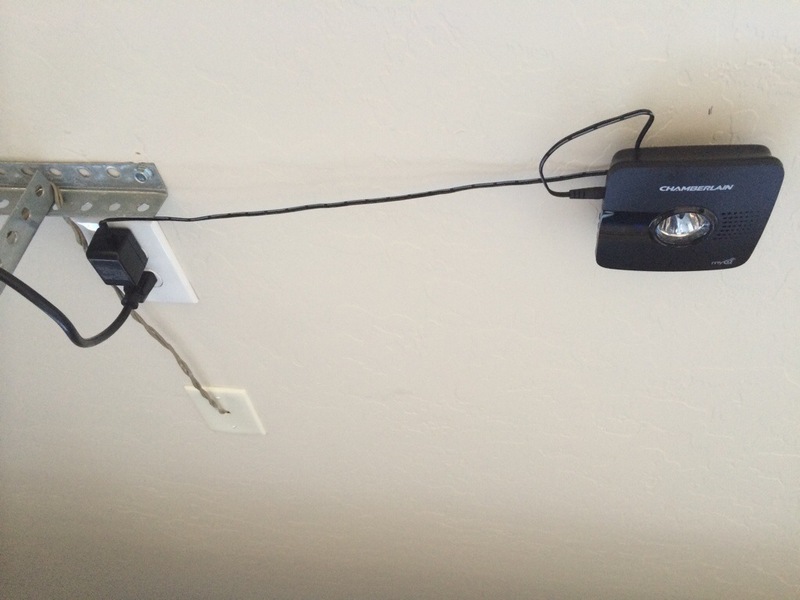 All you needed to do was install the WiFi hub on the ceiling, plug it in, and then secure the door sensor properly on the garage door. With those two things accomplished, the rest can be done from your phone via Bluetooth 4.0. Once you pair your phone, you can share your WiFi credentials from your iPhone to the WiFi hub to get it connected and online, and from there, you can use the MyQ app to create your account, link the hub to the account, and program the hub to talk to the garage door opener. It tries various garage door opening commands, and it knows when it succeeds because it has the sensor on the garage door itself. The only issue I had with the entire online process was that it took about a half hour to get the verification email for the new MyQ account. So I had to wait for the email to activation the account before I was done with everything. 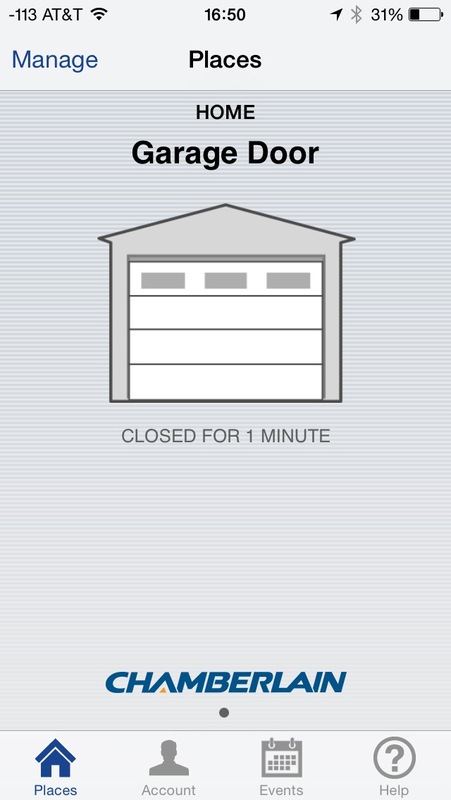 But now I can see the status of my garage door, as well as open and close it remotely. Chamberlain reached out to me to explain the PIN access. First you have to set a PIN code under the Account settings in the app. Then you have to set your security level – you can have it never prompt for a PIN code or 1) on app start, 2) accessing the account, or 3) when you perform an action on a door or gate. Personally, I think a PIN code should be mandatory and that it should prompt you on open/close actions. I’m used to my Chevy Volt OnStar application that requires me to enter a PIN code (which is validated on the server side) to lock/unlock doors, or to remote start the car. It seems like a good way to protect the car from unauthorized actions. Ease of use – being able to transfer my WiFi password over BT to the hub (instead of having to type me 25 character password) made it super easy to get the unit online.